Add a unique look to your '04-'08 Chrysler Crossfire! This great-looking body side graphics kit is designed to fit perfectly on your Crossfire's lower door panel areas as shown. Starting solid at the rear, the easy-to-apply graphics gradually fade to the front with a unique pinstripe feature as shown. Kit will fit both Coupe and Roadster models. 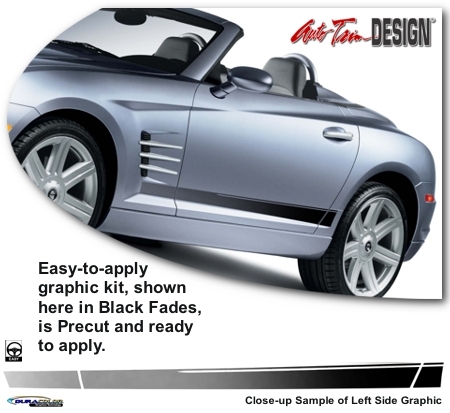 Graphic kit is vehicle specific and will fit any '04-'08 Chrysler Crossfire. They will not fit any other vehicle.